This study peers behind the veil of architectural styles to the underlying social microcosm of the 'building world' of the eighteenth and nineteenth centuries, to examine how the fragile authority of the architect took root there. 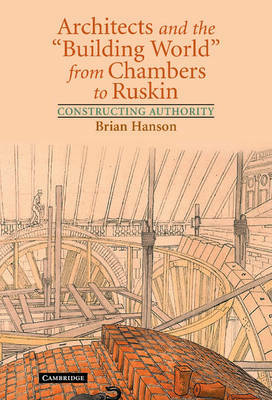 Bringing to architectural history methods more familiar from studies of the social content of poetry and painting, Brian Hanson is able to establish often surprising relationships between many of the key figures of the period - including Chambers, Soane, Barry, Pugin, Scott and Street - shedding light also on lesser figures, and on agencies as diverse as Freemasonry and magazine publishing. John Ruskin in particular emerges here in a different light, as do his arguments concerning 'The Nature of Gothic'. In line with rethinking of the pace of industrialization, and the dynamic between the metropolitan centres and the more slowly evolving 'fringes', Hanson concludes that in some respects Ruskin was closer to William Chambers than to William Morris.